1. Monday- January 27th. The project began today. Students gathered down in the library to have a PowerPoint introduction to some key non-fiction materials, by Ms.Clark, and to run through a relay to practice finding information. Later that day, the students assembled their process journals and reviewed the sequence of events that would happen over the next two weeks. Here Jonathan and Rebecca keep their heads down and dig deep to find the answer during the relay! 2. Tuesday, January 28th. Today, the class focused on designating synonyms for the key words of their questions and predicting what encyclopedias would have the information they needed. 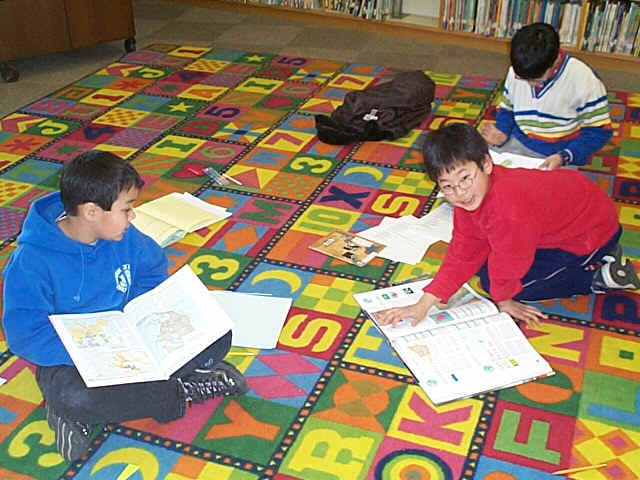 In the library, the students selected an encyclopedia and then followed key steps in search process to narrow where in their article they had to read when it became time to do so. After the library session, they wrote their first process journal entry. Birke, and her arm, get serious about her encyclopedia charting! Click here to see the process skills the children were following for encyclopedias and non-fiction books. 3. Wednesday, January 29th. 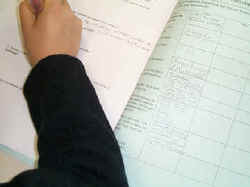 In class, the students were introduced to the steps for finding information from non-fiction books and how to document. They wrote models in their journals and, for the first half of the library time, the student went back to their original encyclopedias and wrote down key word notes about their questions following an introduction to the behavioral rubrics they were being evaluated with. The second half started with the groups gathering back on the mat to review the characteristics of the non-fiction books and deciding which books would be the best fit for each question. After this was completed, the children began their non-fiction book searches. Stephen, Brad and Jonathan having a dig at the non-fiction books. Click here to see the non-fiction books and their attributes. Thursday, January 30th. Today was a continued researching day. The students were able to use both kinds of books to help them answer their six questions. Monica, Tanner and Noah talk over information. Friday, January 31st. It was web searching steps today! The children were introduced to Boolean searching. They discovered how keywords could define the amount of sites they could get. Too, they learned the value of quotation marks and the plus and minus signs in specific student centered directories. Youyu helps Anna Y. locate a search engine on her laptop.